As sweet as cinnamon: Apron Challenge! So many different styles and looks to choose from.... ricrac or not, frill or not... umm what type do I like.....bright or practical....Would you want to join in... click on the link on my sidebar and let Shontelle know that you'll join in her fun challenge. Oh Dawn; I luv, luv, luv the pink background. I am so glad you put it in. It makes a big a difference to all of your buttons...everything looks "connected" and it goes so well with your new header. 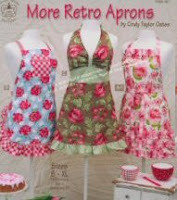 Would really like to fiddle around with a new apron...but my "to do" list is chockers!